December 6, 2017 / J.K. I think the best summary of this book comes from the subtitle of the intro chapter – A Recalibrating of the Season. That would be the Christmas and Advent seasons, both the secular and Christian aspects. 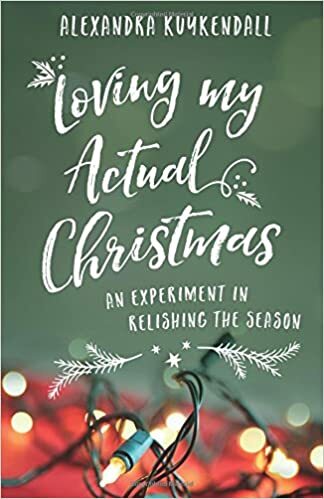 Her goal in writing this is to help people get past the over commercialized, hectic and stressful parts of the American Christmas season. She advocates doing an Advent devotional/study to help ground you in the Christian aspect. So much so, that the majority of the book is her going through the four weeks of advent, what she did that week in actual life and what she did as far as reading, studying, and being thankful. She finishes up the book with a conclusion that is about half as long as the entire book, because there are so many sub parts – scheduling, finances, relationships, and logistics. This is where the book takes a turn from reflection to more practical tips. I wasn’t really a fan of this book, not because it is poorly written or has a bad message or anything of that nature. The main issue – I’m quite far from the target audience. She is one of these busy Christian women with four or five kids that is heavily involved with a number of things and is constantly stressed. I’m a father of one, and overall pretty chill guy. I don’t really relate to the pressure and stress of mom bloggers with multiple active kids. If that is you, then this will probably be a great book to help ground you for the holidays. Another thing I didn’t know when I requested this book, it is a spin off of her other book – Loving My Actual Life: An Experiment in Relishing What’s Right in Front of Me . So, to be fair to the author, had I known about this book, I would have known more about her writing and audience and likely wouldn’t have requested this book. However, judging by the other reviews, had you read that book and enjoyed it, then you will also like this book. I thought her reflections on the Advent devotional were interesting, and more importantly, it will help introduce some people to the concept of Advent. Most American Evangelical churches do not use a liturgical calendar, which can be very helpful in keeping your mind focused on Christ throughout the year. So if nothing else, if readers decide to start an advent devotion for themselves or a tradition with the whole family from reading this book, then it will have been a great success. Finally, her concluding thoughts were very practical and useful. If you are the target audience, they are also probably pretty helpful in reminding you not to go to wild and over-schedule yourself too much, both time-wise and financially. Overall, if you fit in this category and are looking for something on the topic of handling the season, this is probably a good book for you.